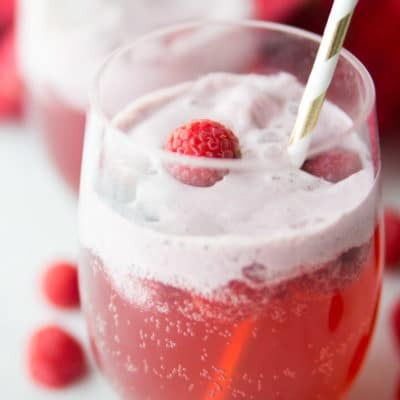 This cranberry raspberry holiday punch is perfect for all of your holiday parties this year. 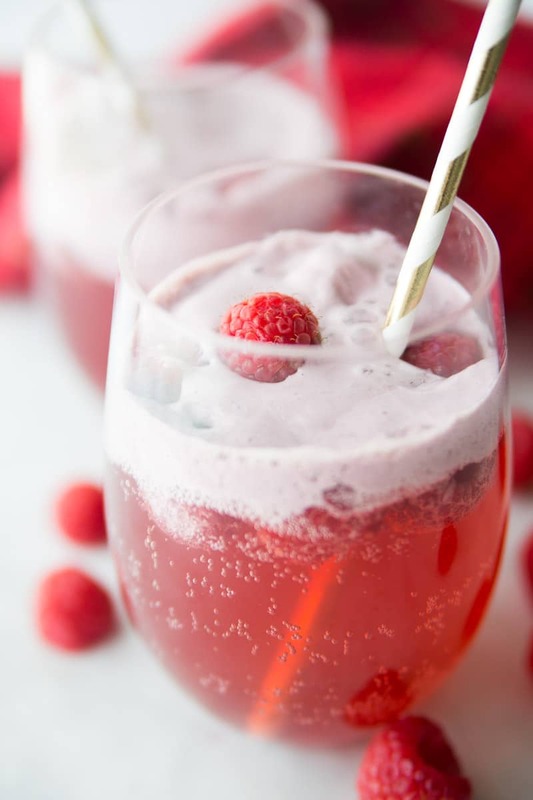 Whether you’re looking for the perfect sherbet punch or just a delicious non-alcoholic holiday punch, this one will have all of your holiday guests asking for the recipe! My husband and I are completely different when it comes to drinks. He drinks water, and I drink pretty much everything else (like this strawberry citrus mocktail!). I love water but can only drink so much of it before I need something a little stronger like juice or a yummy sparkling non-alcoholic holiday punch like this one. I originally created this recipe back in 2014 and it’s still one of my go-to holiday punch recipes every single year! The combination of the cranberry and raspberry flavors together are just absolutely delicious. And if you can find cranberry ginger ale during the holiday seasons, it makes it even better. If not, cranberry juice and ginger ale mixed together is a great alternative as well! How Do You Make Sherbet Punch? You make sherbet punch by simply adding equal parts ginger ale and cranberry juice together then finishing it off with some raspberry sherbet. And honestly – you could really use this same idea with any sherbet punch you want to make. For a cranberry orange sherbet punch try cranberry ginger ale (or cranberry juice + ginger ale) and orange sherbet. I mean it’s good in cranberry orange bread, why wouldn’t it be good as a drink? For a rainbow sherbet punch, do rainbow sherbet with Sprite or 7UP. The possibilities are seriously endless. Just make sure you have equal parts of the two liquids and the right amount of sherbet! For the sherbet, add a couple of scoops of raspberry sherbet to the pitcher and watch the fizzing begin. You could also just mix the ginger ale and juice ahead of time and then add individual scoops to people’s drinks at the party in real-time so they can watch the fizzing fun themselves. The amount of sherbet you use is going to be totally dependent on how much of the liquids you use. I put amounts in the recipe card assuming you’re filling a 2-liter pitcher. If you’re making a huge punch bowl full, you’ll want to add more sherbet (and liquid) of course! The last step is an optional one but a good one if you’re serving it individually to people – add fresh raspberries on top. You could even candy the raspberries if you want or not. Totally up to you, but it adds a nice little garnish to an already pretty punch! Oh and if you’re using this as a holiday punch, these striped straws always add a nice bit of holiday spirit! Good thing I have a huge collection in my craft room! 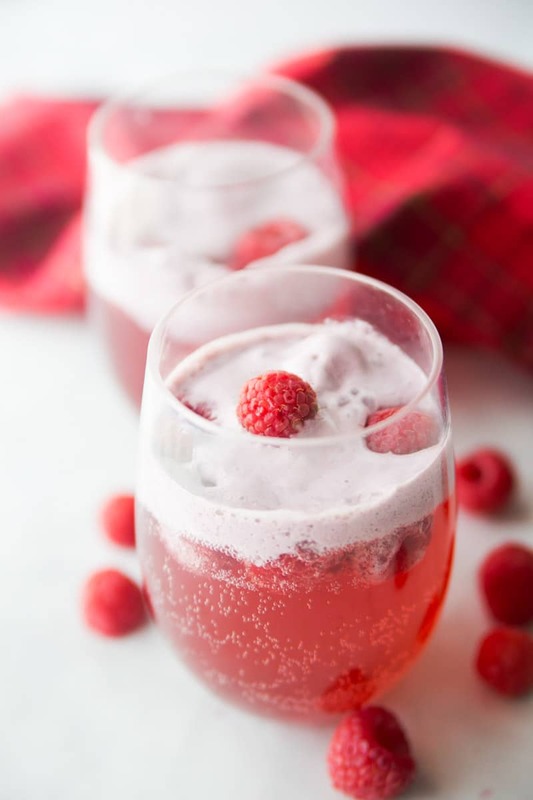 This cranberry raspberry holiday punch is perfect for all of your holiday parties this year. 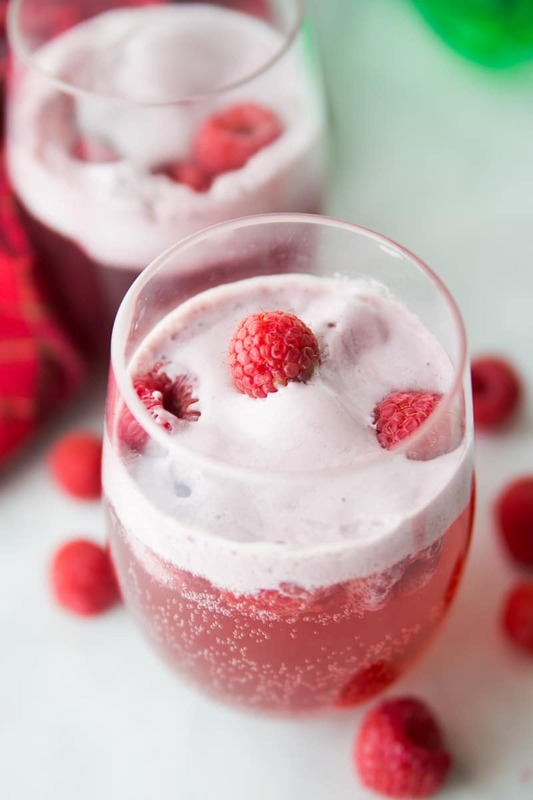 Whether you're looking for the perfect sherbet punch or just a delicious non-alcoholic holiday punch, this one will have all of your holiday guests asking for the recipe! This recipe was designed for a 2-liter pitcher. If you are using a bigger or smaller container, scale the recipe accordingly. Fill up your recipe box with all of the best non-alcoholic holiday punch recipes! These are some of my other favorites. Don’t forget to pin this holiday punch recipe for later! Is there a recipe or do we do the whole container of sparkling soda, full cranberry rasberry juice & how much sherbet? What about the garnish/real fruit? Can we do half bottle of sparkling soda of our choice/half bottle of cranberry rasberry juice & 1/3 c or 1/2 c of sherbet? 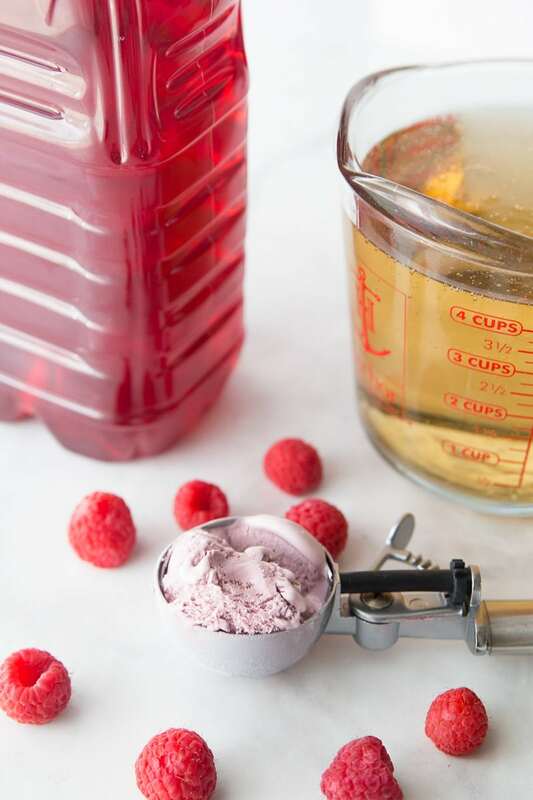 You’ll want to do equal parts ginger ale and equal parts cranberry raspberry juice. If you’re using a full bottle of the juice and soda, I’d recommend about 1/4 gallon of sherbet. Then go down from there, hope that helps! Can you make it without the sherbet? You can but then it wouldn’t really be a punch, it’d just be juice and not the same thing at all. Wow, Thanks for all of these great ideas.